President Trump walks past Sen. Collins as he walks to a desk to sign the 'Patient Right to Know Drug Prices Act' and 'Know the Lowest Price Act of 2018,' during a ceremony in the Roosevelt Room of the White House in Washington, Wednesday, Oct. 10. 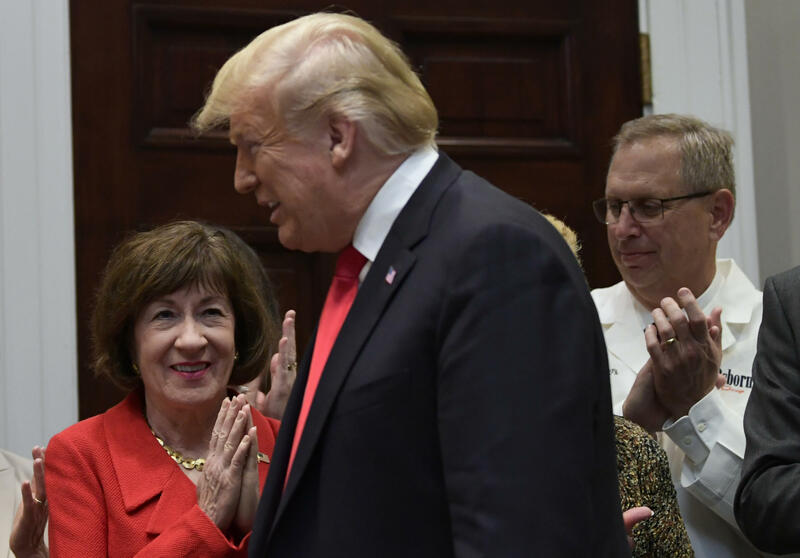 “I would like to thank Senator Susan Collins for her incredible leadership on this legislation,” Trump said. “And, I haven’t seen you in a few days,” he joked. The legislation stops drug companies from prohibiting pharmacists from telling consumers that it might be cheaper for them to buy a particular drug outright, instead of going through their insurer. The drug companies placed these clauses in contracts with pharmacies. Collins says that she introduced the bill after pharmacists in Maine complained about the practice. “I first learned about these gag clauses from pharmacists in Maine, who were so frustrated that they were prohibited from providing their patients with information,” Collins said in May, when she introduced the bill. Originally published Oct. 10, 2018 at 3:27 p.m. ET.